Growthcraft is a mod for Minecraft, that was originally developed by Gwafu. It aimed to improve the agricultural and farming aspects of the game. Improvements were added to the game included but were not limited to the addition of unique crops and fun ingame-hobbies. Gwafu has since moved on from Minecraft and released his source code for the Minecraft Modding community to fix the FluidStack issue that broke brewing. We have taken up the torch to continue his fine work as a Community Edition project. We currently distribute the mod collection as a complete download or in a split jar bundle. Those that use the entire Growthcraft suite, you now only need to update a single mod. Submit feature request via our GitHub Issue Tracker. We are going to be using the FTB Gamepedia Wiki unless some one submits a request for a better platform. ©2014 - Gwafu, All Rights Reserved. Gwafu has given mDiyo full rights for continuing the plugin. mDiyo has extended this to the Growthcraft Comminity Edition development team and is part of the dev team. If you have any concerns regarding copyright, please feel free to reach out to Gwafu to have them addressed. We are currently only file hosting through the community GitHub releases and will be posting the compiled mods and hosting them on the Curse Forge site. Please refrained from hosting/posting your own versions of this mod. Instead, post your pull requests to the community edition so we can all benefit. If you find that you are having to go through a ad site to get to the mod please report it as that means the the CE team is not hosting that copy. All that we ask is that you post a request to the GitHub repo and permission for the inclusion in your modpack will be automatically granted. We ask for you to post your mod index so that we can gauge future compatibility with other mod's. Go on. You're free. We all love you texture pack creators. Q: Can I add your mods in my modpack? A: Read the Copyright section above. Q: Can I upload/host your mods in my/another site? A: Read our GitHub Wiki or read Gwafu's Original Growthcraft Manual. Q: Can you upload the source files? A: In July 2015 Gwafu posted the original source code. We have since made a significant number of improvements. Get the latest source code from our Github repo. Q: I have an idea for a mod which really fits the theme of your mods. What should I do? A: You can create a feature request in our GitHub project or fork the source and bring your idea to life with a pull request. Q: Hey! You copied this mod! A: Yes we did, from Gwafu's GitHub release of the source code, to continue his hard work after he announced that he was taking a break from Minecraft for awhile. He is listed as a collaborator for the Community Edition and we will always save a seat for him to return too. Additionally, mDiyo has joined the team with full rights to the mod. Excellent. Perhaps now it won't be such an issue of "This is broken!!! *whine whine whine*" since people don't expect to find anything more than questions and comments in the comments. Good to see this getting its own thread so that's it's easier to follow the updates. Going to be using this together with millenaire on my server. Could you possible make it so the rice works cross? I'm glad to see this mod lives! It was always my favorite of the "extra kinds of crops" mods. Is there any chance this can be released on CurseForge, too? A revival of the mod? YES! I'll see with the guys working on coding to give some attention to oredict. And about the apples, we use the vanilla one, so it is already in sync with most mods. 'm glad to see this mod lives! It was always my favorite of the "extra kinds of crops" mods. WIP. It will be posted here as soon as it's ready. Coincidently, I'm playing it with millenaire too, and I feel the same about it, at grapes and rice. But, as I said above, it's a OreDictionary thing, see the first quote I responded. I'll see with Alatyami if he can put the To Do List on this thread. Me and Sunconure (specially) will keep it updated. We have lots of plans! I'm really glad that the mod had been combined into one jar but I see that the plan is to split it back up. Is there any way that you could also keep a combined version around? Gwafu mentioned before that the intention was to eventually just combine everything into one jar and use config settings to toggle features. I know that's a bit much so it would be great just to have a single jar for future releases. I love the designs of the new fields, though it seems they need to generate some kind of base for them for when they generate in the air or over water, as currently they just float when that happens with open middles (with the rice field and bamboo pen having floating water), and the orchard and bamboo pen have the saplings/shoots pop off if they generate on sand. And to excavate their interiors properly too. Attachment to illustrate the problem. 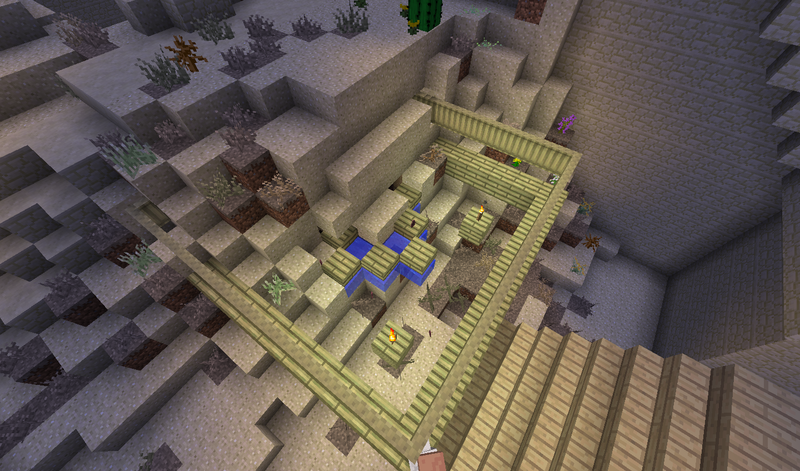 The latter seems to apply to the apiarist's house as well, since I found it full of sand and plants. And with the apiarist's house, I personally find the black and yellow checkerboarding and black stained windows to be a bit strong, though I can't disagree that it's thematic (though maybe stripes instead of checkers would look a little more fitting?). But this is much more of a taste and stylistic thing. But it's looking great so far though, and I'm excited to see what new things there'll be! Super excited to see a proper release of the community-built Growthcraft! Looking forward to seeing how this great mod can get better. Thanks for the support, glad you enjoy it! The plans are to have both files on (Split and Solo jars), ready to download, probably on the next release. Since I built the new models, I must me blamed for that (I thought that it could happen, but made nothing about it, to see how it goes, and gone bad). I'll fix it soon and the next release shall have it. About the connection with glass panes and etc, I tried to do it when I first built the Bamboo Yard, and I think we should work on that. Chisel interaction? Yeah, I need it. Do you think stripes are better than checkers on the apiary? I'll give it a shot, send a screenshot here and there. I'm actually considering remodelling it, a honeycomb-shaped house sounds cool for you? That honeycombed shape idea is Great! Much better than the checks. But I'm certainly interested in how the honeycomb house will look It sounds like you have some ideas already, but as a suggestion, how about like the square, doorless houses, with plank walls bordered by logs, but obviously hexagonal, and then maybe with slabs on top like the blacksmith's (but wood)? I haven't really worked with the bees that much, what's wrong? Are the bees not producing honey? Or can't you find honeycombs from the hives? Reply me and we shall see what we can do. I'll try to release some screenshots tomorrow (until Sunday at least), and I'll try whatever you guys suggest me. I tried to do the apiary easily detected by minimaps (with the checkers and strong colors) for people who play with village multiplier mods (Better Villages like, to mark it as an interesting point) but not so away from the village builds style. The purpose of the black glass was to make it similar to nets used on real apiaries, but I think it got kinda harsh. I'll do my best. Looks like the checkers didn't pleased the players. What I've seen is that they don't produce any honey or honey combs, Went AFK for a little while with a few apiaries and got a bunch of bees, but no honey whatsoever. Do I need to plant flowers around the apiaries to produce honey or is this a bug. Yeah you need some flowers around it to produce honey, and empty combs are found by breaking the bee hives, you need them to produce honey too, but I'm almost sure that they replicate with the honey production. Glad to see this has been picked up. Definitely one of my favourite mods.